Winner of the Swiss Prize at the 1979 Geneva International Solo Competition, he has made numerous solo appearances with orchestras, bands, in solo recitals and as a chamber musician. As an ensemble collaborator, he has appeared in concert and on numerous recordings with The Houston Symphony, Atlanta Symphony, San Antonio Symphony, Rochester Philharmonic, Chicago’s Music of the Baroque Ensemble and the Houston Symphony Chamber Players. Barnhill is in demand as a teacher of the Trombone and has given master classes throughout the United States and abroad. 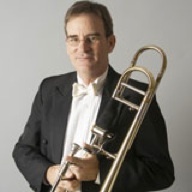 Currently Associate Professor of Trombone at the Shepherd School of Music, he has also held faculty positions at The University of Texas, the University of Houston, Sam Houston State University and St. Thomas University. Allen Barnhill graduated with honors from the Eastman School of Music where he studied with Donald Knaub. A native of Elizabethtown NC, he received his early musical training from Band Director Ray Haney, trombone teacher Jack Pindell and piano teacher Mae Melvin. He enjoys water skiing, snow skiing and golf.